Here is my rhetorical analysis essay so far. I have yet to write one more body paragraph and the conclusion. Over the past few years, a movement urging smokers to quit has been sweeping across America. Countless commercials, posters, social media posts, and medical professional statements have been circulating through society, all working toward the same goal: Help smokers quit smoking. It is a well-known fact how difficult it is to quit smoking, and many attempts have been made to ease this transition for smokers – nicotine patches, support groups, etc., but have not been successful in helping all smokers quit. Another problem faced by these campaigns is that they cannot stop people from starting to smoke, which starts the whole process over again. Seeing the negative effects of smoking drives smokers to want to quit, but, as mentioned previously, this is a very difficult task. So, a whole new market has been created: smokers looking to find a way to smoke without the harmful side effects of conventional cigarettes. Enter the blu electronic cigarette. This device contains a smaller amount of nicotine than normal cigarettes, but the smoke is all water vapor, thus eliminating almost all of the harm of cigarettes. People everywhere are spreading the word about these devices, and advertisements are popping up all over written and digital media. One ad in particular, the “Why Quit?” ad, uses appearance and berating language to convince wannabe quitters into electronic cigarette consumers. 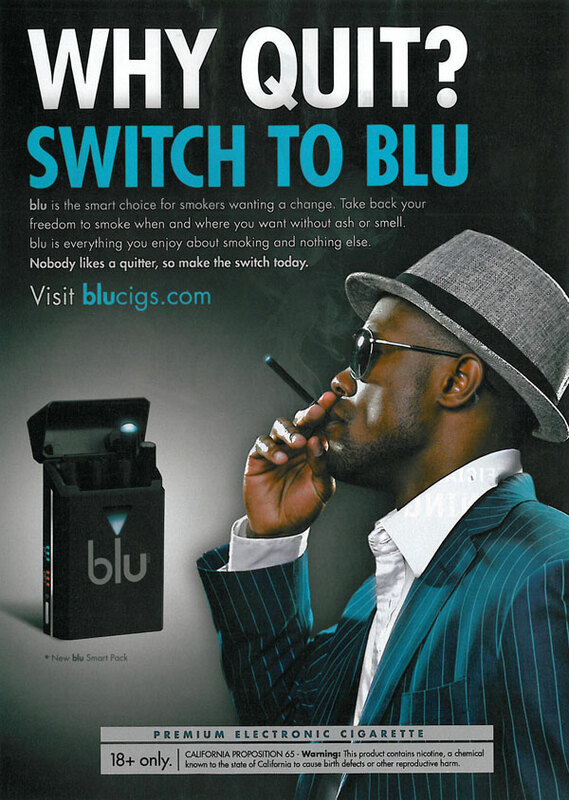 When first viewed, the ad’s large heading and picture of a man smoking an electronic cigarette creates a compelling argument for switching to blu eCigs. The heading of this advertisement, originally launched in the fall of 2013, creates a safe haven for those smokers looking to quit their lethal habit. The words, “Why Quit? Switch to blu,” make it seem as though it is in smokers’ best interest to not quit smoking, but rather smoke electronic cigarettes rather than “normal” cigarettes. This heading portrays the act of quitting smoking in search of better health as something undesirable, and idiotic. This portrayal makes switching to blu eCigs all the more pleasing because it allows the consumers to continue smoking, and the switch now seems to be the most logical choice. Also, the man smoking the blu eCig in the ad appeals to the audience’s human need to fit in and be liked. The man is depicted as a very cool person, who, based on his clothing, is successful in life. His clothing is expensive, his jewelry is large and flashy, and he has the overall demeanor of someone who has made it in life. And what is he doing? Smoking a blu electronic cigarette. This then makes the viewer believe that he/she can also achieve this wealth and status in society if he/she switches to blu eCigs. Finally, the portrayal of the electronic cigarette itself draws the audience in. It has the same shape as a normal cigarette, but is black, and has a mesmerizing glow at one end. This glow appeals to the simplest of human liking: shiny objects. This glow lures the viewers in, and captivates him/her, allowing the blu eCig to control him/her before even viewing the actual product. The paragraph underneath the large heading of this ad uses berating, yet inspiring language to convince the viewer to switch to blu eCigs. At first glance, this paragraph seems harmless. 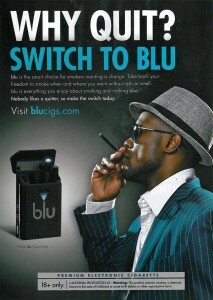 It presents the existence of the blu electronic cigarette, showing the viewer a new possibility for “healthy” smoking. However, in the next sentence, the ad states that blu eCigs will allow smokers to, “[t]ake back [their] freedom…” Given this ad was displayed primarily in America, the viewers of the ad have a very strong belief of what it means to be free. America is supposed to be a place where someone can be their own person, and celebrate who he/she is as an individual. This sentence is chastising smokers for letting cigarettes take away this American right. Blu eCigs is taunting the ad’s viewers, almost saying, “How could you let them take away your freedom? Are you not an American? Do you not enjoy being free? Who are they to tell you what you can and cannot do?” This lights a fire under the viewers, and frustrates them to the point of wanting to do something about it. So, what do they do? They use the resource in front of them to come up with a solution. They see that they will be able to get their freedom back if they switch to blu eCigs. Also, the last sentence of this paragraph makes a personal attack at the viewers and their work ethic. It states, “Nobody likes a quitter.” This statement makes the viewer believe that they are not working hard enough to maintain their habit, and that they are not hard working individuals because of this fact. Also, this attacks the viewer’s sense of being an American. Part of being an American, in blu eCigs’ mind, is working tirelessly to achieve goals. So, if these smokers quit, they will never achieve the happiness or success of the man depicted in the ad, and will be shunned for being “quitters.” Again, this statement is using the fact that humans want to be liked and want to fit in, and they will do almost anything to achieve acceptance. So, the ad again portrays the idea of quitting smoking as illogical, convincing the viewer to switch to blu electronic cigarettes, and once again become a part of society. Overall, this paragraph breaks down the viewer. It makes them seriously consider who they are as a person, as an American, and as a member of society. This deconstruction of self allows blu eCigs to rebuild the viewer into someone that chooses to smoke their product, and become the person that this company envisions as an ideal citizen. – Transitions: I’m afraid that my ideas jump randomly from one to the next. -Cohesiveness: I am unsure as to whether the ideas I am presenting are all leading toward a common theme for the ad. Maybe this will become more clear when I finish the essay, but for now, I am unsure. -Following the assignment: I have been known, in many occasions, to go off topic, or stray from an assignment. Does this paper follow the assignment? Thank you for taking the time to read this and provide feedback. This entry was posted in RCL Blog and tagged rclblog on October 9, 2014 by Connor Cassady. It seems to me that you’ve made several good points about how the Blue eCig advertisement tries to convince its viewers and what the logic behind those methods is, but I’m having trouble picking out what your central idea is – what exactly is your thesis arguing? I don’t think you have anything to worry about in regard to your transitions! Everything seems to flow pretty smoothly, but I think that your second body paragraph could actually be split up into two different ones, both with very strong ideas and support. Perhaps one could be about how the ad plays upon our dislike of quitting and the other about how it uses American freedom? As for your worries about straying from your topic, I don’t see much of that at all in your paper so far! It’s very focused on the ideas you present about the ecigarette ad. Looks like you’ve got a great start here! Transitions: I think your transitions actually are not distracting at all and don’t take away from your arguments here. Perhaps your could start the second body paragraph with “Coming from a more textual standpoint” or something more to indicate that you are making a switch from more visual to more textual parts of the ad. Cohesiveness: This is a very very strong paper. Your thesis is fluid within a great intro and shows what you’re trying to accomplish. It touches on every piece of your advertisement and fully touches on each piece of work; I’m very impressed! Your analysis is thorough but not overkill and I think that is a hard balance to find. One thing that I would advise you to look over just a little is your word choice. You use different versions of the term “smoke” a lot when referring to many different things, just look out for that so it doesn’t seem repetitive! The Assignment: This paper is definitely on the assignment. You have explained clearly and thoroughly who the audience is and what message the company is trying to send to them. I would maybe encourage you to show more of why it is relevant today. Could you add some statistics about how many people use eCigs versus real cigarettes? Or maybe whether or not cigarettes are declining in popularity?